As of March 2009, 11.1 million unauthorized immigrants were living in the United States. 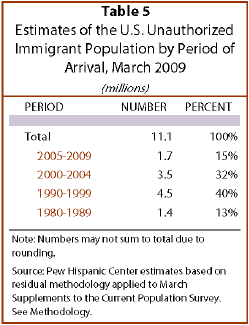 Pew Hispanic Center estimates indicate that the size of the unauthorized immigrant population peaked in 2007 at 12 million. From 2007 to 2009, the number of unauthorized immigrants declined by a million people, or 8%. This decline represents a change in the pattern throughout the decade. There were 8.4 million unauthorized immigrants in 2000, a number that increased in 2001, leveled off for two years and then grew steadily from 2003 to 2007. Despite the population’s recent decline, the number of unauthorized immigrants grew 32% from 2000 to 2009. The number of unauthorized immigrants in 2008, 11.6 million, appears to be larger than the number in 2009, but this finding is inconclusive because the difference between estimates for the two years is not statistically significant. The estimates are derived from sample surveys and thus are subject to uncertainty from sampling error, as well as other types of error. Each annual estimate of the unauthorized population is actually the midpoint of a range of possible values that could be the true number. In addition, the change has its own margin of error. These ranges represent 90% confidence intervals, meaning that there is a 90% probability that the interval contains the true value. 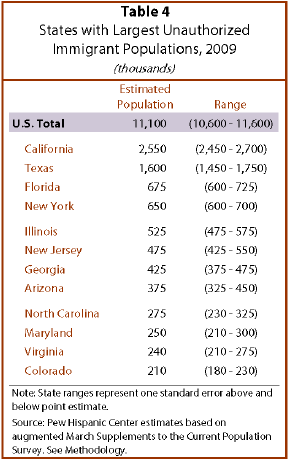 For example, as can be seen in the table on this page, the range of possible values for the unauthorized population in 2008 was 11.1 million to 12.1 million. 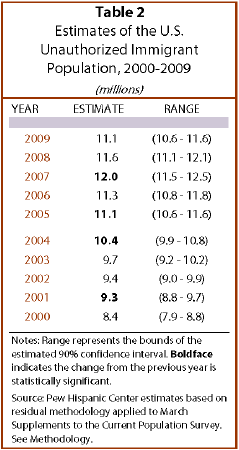 In 2009, it was 10.6 million to 11.6 million, which overlaps the 2008 range. In this table, boldface numbers indicate when the change in any one year has a statistically significant difference from that of the year before. There also was one year in the decade—2009—when the decline from two years earlier was statistically significant; in four years—2004 through 2007—the increase was statistically significant compared with two years earlier. According to estimates from the Department of Homeland Security, 10.8 million unauthorized immigrants were living in the United States in January 2009, compared with 11.8 million in 2007, the peak number for the decade. These estimates are consistent with the Pew Hispanic Center estimates. The DHS estimates were developed using a similar methodology but were based on a different Census Bureau data source, the American Community Survey. 2008 Pew Hispanic Center report, the annual flows of legal residents began to surpass the annual flows of unauthorized residents around 2007, reversing a trend that began in the late 1990s. The combination of decreased flow of unauthorized immigrants and slightly increased flow of legal immigrants has played a role in changing the composition of the nation’s foreign-born population. Unauthorized immigrants have become a smaller share of the nation’s foreign-born population: 28% in 2009, compared with 31% in 2007. In concert with the national decrease in unauthorized immigration, some South Atlantic and Mountain states experienced statistically significant declines in their unauthorized immigrant populations from 2008 to 2009. No state had a statistically significant increase. The South Atlantic division, which extends between Delaware and Florida and includes several states that have become new immigrant magnets in recent years, had a decline in its unauthorized population, from 2.5 million in 2008 to 2 million in 2009. Within that division, Florida’s unauthorized immigrant population declined by 375,000 during that one-year period, to an estimated 675,000 people. The number of unauthorized immigrants in Virginia declined by 65,000, to 240,000 people. In the area that encompasses the rest of the region, the unauthorized immigrant population declined by 160,000, to 1 million. Among the Mountain states as a group,4 the number of unauthorized immigrants declined by 160,000, to 1 million, from 2008 to 2009. Nevada was the only state to have its own statistically significant decline; its unauthorized immigrant population went down by 50,000 during that year, to an estimated 180,000. A group of three other Mountain states—Arizona, Colorado and Utah—had a combined decline of 130,000 unauthorized immigrants, to a 2009 total of 700,000. Although unauthorized immigrants live in every state, they are highly concentrated in only a few states. In 2009, just over half (54%) lived in only five states that are longtime immigrant destinations—California, Texas, Florida, New York and Illinois. California alone houses nearly a quarter (23%) of the nation’s unauthorized immigrants. States with large numbers of unauthorized immigrants also include several that have become new destinations over the past two decades. They include Georgia, Arizona and North Carolina, where more than a million were estimated to reside in 2009. Those states’ combined share of the unauthorized immigrant population grew to 10% in 2009 from 4% in 1990. 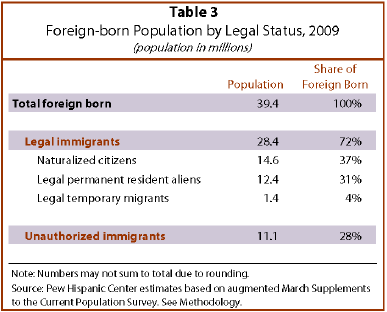 Unauthorized immigrants accounted for 3.7% of the nation’s population in 2009. Their shares of states’ total population were highest in California (6.9%), Nevada (6.8%) and Texas (6.5%). Arizona (5.8%) and New Jersey (5.6%) round out the top five states where unauthorized immigrants made up the largest share of the population in 2009. There also are seven states—Alaska, Maine, Montana, North Dakota, South Dakota, Vermont and West Virginia—where unauthorized immigrants account for less than 1% of the population; the Pew Hispanic Center estimates that the unauthorized immigrant population in each of those states was less than 10,000 in 2009. Latin American countries account for the overwhelming majority—four-in-five—of unauthorized immigrants. In March 2009, there were 8.9 million unauthorized immigrants in the U.S. from Mexico and other parts of Latin America. Of those, 6.7 million were from Mexico, or 60% of all unauthorized immigrants. An additional 2.2 million unauthorized immigrants, or 20% of the total, were from other Latin American nations (about 1.3 million from Central America, 575,000 from South America and 350,000 from the Caribbean). Unauthorized immigrants from South and East Asia accounted for 1.2 million of the total, or 11%; Europe and Canada accounted for about 475,000 unauthorized immigrants, or 4%. Smaller numbers came from the Middle East (150,000, or about 1% of the total). 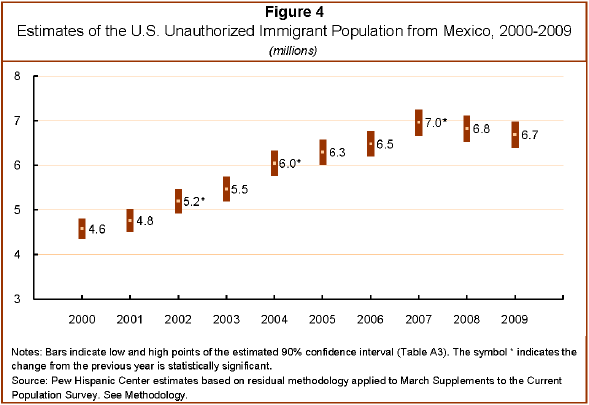 The unauthorized population from Mexico grew steadily from 2001 through 2007, expanding from 4.8 million to 7 million during those years. Since then, the number from Mexico has been stable. The population of unauthorized immigrants from other countries in Latin America did not grow at a statistically significant rate until it peaked at 2.8 million in 2006. After holding steady in 2007, the numbers dropped notably—to 2.2 million in 2009. That represents a decline of 22% over the two-year period. The number of unauthorized immigrants from other nations grew in 2001 but was statistically unchanged after that. In 2009, 2.2 million unauthorized immigrants came from nations outside Latin America. 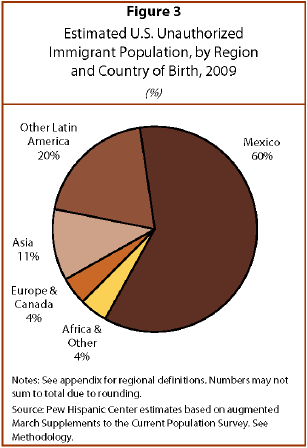 That represents a 20% share of unauthorized immigrants in 2009. Over the decade, the share of unauthorized immigrants who are from Mexico rose from 51% in 20015 to 60% in 2009. The share from other Latin American nations declined from 25% in 2001 to 20% in 2009. The share from nations outside Latin America decreased slightly, from 24% in 2001 to 20% in 2009. About three-quarters of unauthorized immigrants are Hispanic (76%); among non-Hispanics, 11% are Asian, 8% are white and 5% are black. 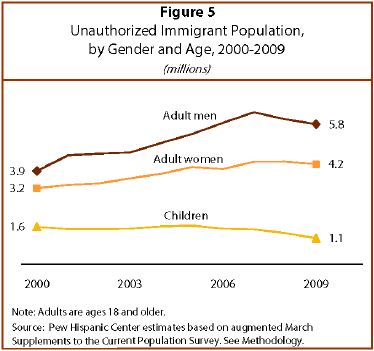 Nearly half the unauthorized population in 2009 (47%) arrived in the U.S. in 2000 or later. Of these, 1.7 million, or 15% of unauthorized immigrants, arrived from 2005 to 2009; 3.5 million, or 32% of the unauthorized population, came to the country from 2000 to 2004. An additional 40% of unauthorized immigrants—4.5 million—arrived during the 1990s, when immigration rates in recent decades reached their peak. An estimated 1.4 million unauthorized immigrants, or 13% of the total, arrived during the 1980s. 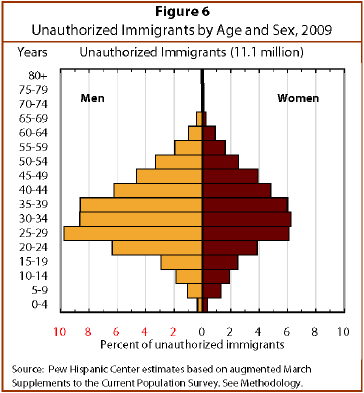 Among unauthorized immigrant adults, men outnumber women, 5.8 million to 4.2 million as of 2009. The number of men grew rapidly through the decade, peaked in 2007 at 6.3 million, and declined by about half a million people from 2007 to 2009. The number of women grew more slowly before peaking in 2007 at 4.3 million and leveling off since then. 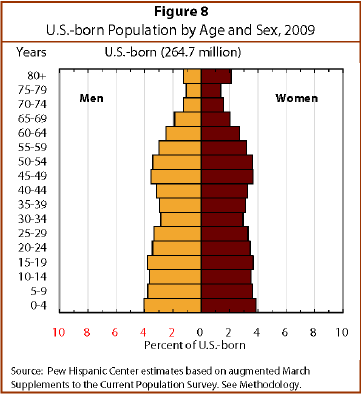 As the accompanying age pyramid charts illustrate, the unauthorized immigrant population has a higher share of people in their 20s and 30s than do the legal-immigrant or the U.S.-born populations. More than half of unauthorized immigrants (58%) were ages 18 to 39 in 2009, compared with 28% of the U.S.-born population and 34% of legal immigrants. The elderly make up a smaller share of unauthorized immigrants than they do legal immigrants or the U.S.-born. Only about 1% were ages 65 or older in 2009, compared with 16% of legal immigrants and 13% of U.S.-born residents. Children make up a smaller share of the unauthorized immigrant population than of the U.S.-born population, but one important caveat is that almost four-in-five children of unauthorized immigrant parents are born in the United States. An earlier Pew Hispanic Center report estimated that 5.1 million children lived in households with at least one unauthorized immigrant parent in March 2009. Of that total, 4 million were born in the U.S. and are citizens by birthright and 1.1 million were born abroad and are themselves unauthorized. The population of children with at least one unauthorized immigrant parent was 42% larger in 2009 than in 2000, when it numbered 3.6 million. However, its growth essentially has leveled off since 2008. Overall growth trends mask differing patterns in the two components of this population. The number of U.S.-born children of unauthorized immigrants nearly doubled from 2000 to 2009; it rose through the decade before leveling off in 2008. The number of foreign-born children of unauthorized immigrants declined somewhat over the decade. 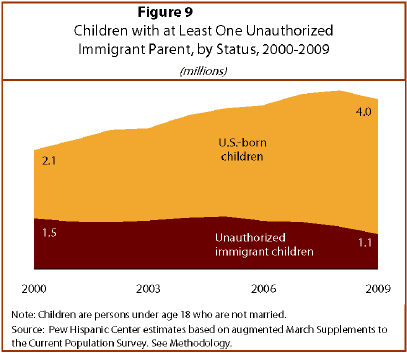 As a result, 79% of the children of unauthorized immigrants were born in the United States in 2009, compared with 57% in 2000. In March 2009, there were 7.8 million unauthorized immigrants in the nation’s labor force, representing 5.1% of the labor force of 154.8 million people. The unauthorized immigrant labor force grew in 2001, leveled off for three years and increased again after 2003 until peaking in 2007 at 8.4 million people. It declined in 2008 and again in 2009. Among men who are working age—18 to 646—unauthorized immigrants are more likely to be in the labor force than are legal immigrants or the U.S. born. 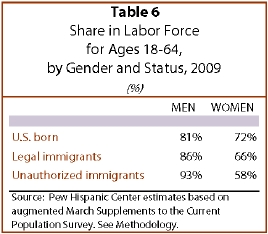 In 2009, 93% of working-age unauthorized immigrant men were in the labor force, compared with 86% of working-age legal immigrant men and 81% of working-age men who were born in the United States. The opposite is true for women ages 18 to 64. In 2009, 58% of unauthorized immigrant women were in the labor force, compared with 66% of legal immigrant women and 72% of U.S.-born women. Among the reasons for this disparity is that women who are unauthorized immigrants are more likely than legal immigrants or U.S.-born women to say they are not working because they are raising children at home. Women who are unauthorized immigrants are less likely than U.S.-born women or legal immigrants to be out of the labor force because they are disabled or retired, and they are less likely than U.S.-born women to be in school. 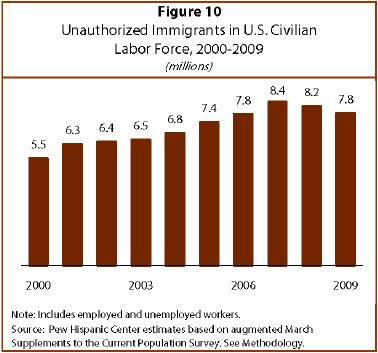 As the number of unauthorized immigrants in the labor force declined from 2007 to 2009, so did the number employed. (In addition to those who are employed, the labor force includes those who are looking for work.) The number of employed workers of all ages who were unauthorized immigrants rose to 8 million in 2007 from 5.2 million in 2000, before declining to 7 million in 2009. Their share of employed workers declined to 5% in 2009 from 5.5% in 2007. The number of employed U.S.-born workers and legal immigrant workers also declined, but their shares did not. The unemployment rate for unauthorized immigrants of all ages in March 2009 was higher than that of U.S.-born workers or legal immigrants—10.4%, 9.2% and 9.1%, respectively. This was the case in 2008, as well as from 2000 to 2003. From 2004 to 2007, unauthorized immigrants had similar or lower unemployment rates compared with the other two groups. These overall unemployment rates mask differences by gender. Women who are unauthorized immigrants of all ages have had higher unemployment rates through the decade than U.S.-born workers or legal immigrants. Unauthorized immigrant men of all ages had lower unemployment rates than U.S.-born men or legal immigrant men from 2001 to 2007. In 2008, their rate exceeded those of the other groups but in 2009, their 10% unemployment rate was lower than the 11% rate for U.S.-born workers and similar to the 10.2% for legal immigrant workers. State patterns of unauthorized immigrants in the labor force vary widely. States with the largest population shares of unauthorized immigrants also tend to have the largest shares of unauthorized immigrants in the labor force. California had the largest number (1.8 million) of unauthorized immigrants in the 2009 labor force, and they made up a larger share of the labor force there (9.3%) than in any other state except Nevada (9.4%). Texas had an estimated 1 million unauthorized immigrants in the labor force in 2009, which represented 8.7% of the labor force. New Jersey had the same share of unauthorized immigrants in the labor force (8.7%). In terms of numbers, Florida, Illinois, New York and New Jersey form the next tier of states (behind California and Texas), with between 400,000 and 525,000 unauthorized immigrants in the labor force. A handful of states, generally the same ones with the smallest unauthorized immigrant populations, also have the smallest number and share of unauthorized immigrants in their labor forces. In 2009, Alaska, Maine, Montana, North Dakota, South Dakota, Vermont and West Virginia had fewer than 10,000 unauthorized immigrants in the labor force, less than a 1% share.